Touring Milos Island on a motorbike is the best way to experience the beauty of the island. Moto Christos offers the most competitive rates, and free pick-up and delivery to/from the Adamas seaport, Milos airport, or your hotel, throughout the island of Milos. 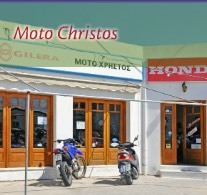 Moto Christos Moto Rent, Sale and Service is the oldest and largest moto sale and rent shop in Milos, with spare parts inventory, and a maintenance shop, operating since 1975. 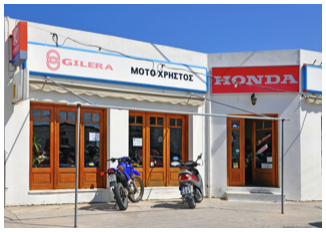 At Moto Christos, motorbikes, mopeds, scooters and quads are well maintained and new models are always available. The condition of the motos is guaranteed, and Christos and his road assistance team are always available to scramble in case of emergency. Rates for 2017 are quoted below per day, in Euros. Helmets and 3rd party insurance are included. Driving license type A is necessary for scooters/enduro and quad 50cc. Driving license type B is necessary for quad 150cc/200cc/300cc. Please note: A 10% discount applies to all reservations longer than 7 days.